Annie Bonza started in fashion as a 16-year-old cutting and design apprentice in Auckland in 1955. 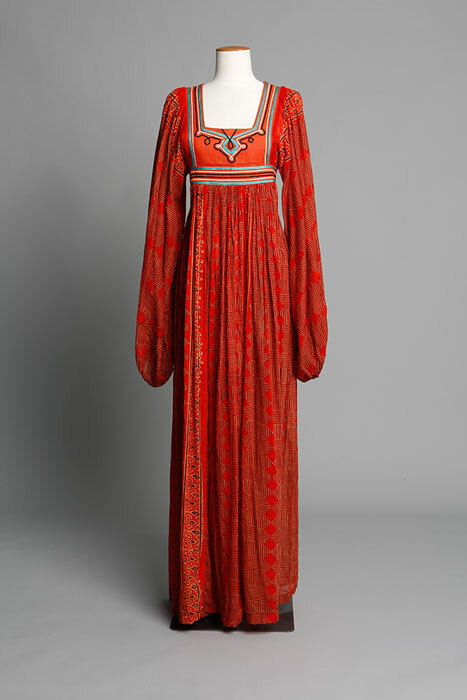 After working for small fashion house Pour Vous, she moved to Sydney in 1964, where she learned her trademark embroidery technique, cornelli, which is used on the bodice of this dress. Bonza returned to New Zealand in 1968 and opened a boutique in Auckland, which became popular with musicians. Bonza started to design outfits for the television music show C'mon, and her business took off. However, running a successful fashion label was taxing, and Bonza closed the shop and moved to the Cook Islands, where she lived from 1977 to 1984 and from 1996 onwards. She continued to design after her 1977 departure.